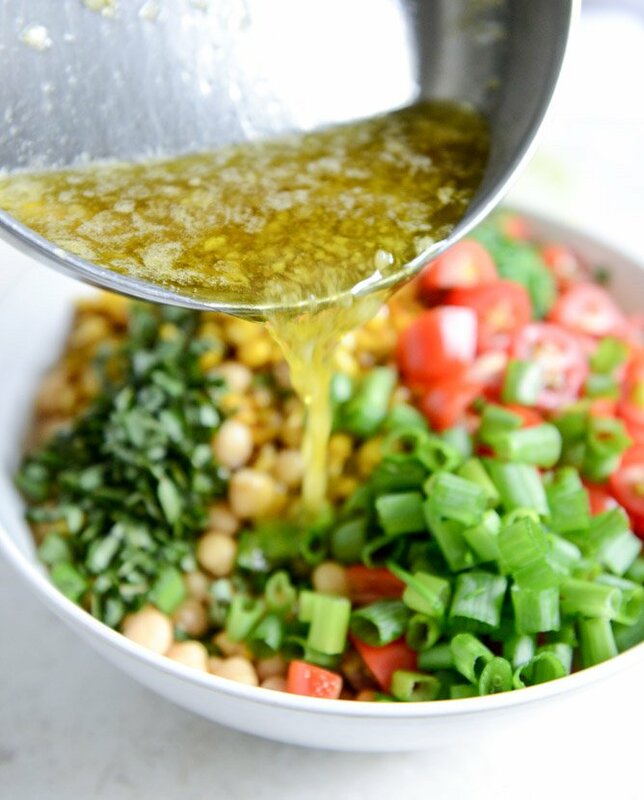 The Simple Chickpea Salad I’m Losing My Mind Over. This is so easy. But it tastes SO FAB. I’m embarrassed to tell you about it but apparently not too embarrassed to tell you since it’s here. It’s so a make-Monday-better type of thing. An I-drank-way-too-many-summer-beers-because-they-taste-so-good-with-citrus type of thing. A perfect pool-pig-out-food-and-still-wear-a-swimsuit type of thing. A leave-extra-room-for-one-of-those-chocolate-peanut-butter-haagen-dazs-ice-cream-bars type of thing. An I-can’t-stop-shopping-all-these-summer-sales-but-forget-to-bring-a-snack type of thing. An idea-you-must-share-with-invisible-internet-friends-on-your-annoying-blog type of thing. It can be lunch or dinner or whatever you want! I don’t know whyyyyy it just tastes so good. Okay I do know why. It’s the corn and the honey and the garlic and the herbs and the lime and all that. And once it sits, it’s just phenomenal. I cannot eat chickpeas any other way at the moment. I’ve been making this salad on Sundays for the last couple weeks and eating it until it’s gone. CANNOT STOP. Um, and last week after I made it, I had some leftover whipped feta from a party and get this… spread the whipped feta on toast… topped it with the chickpea mixture. UGH. Dead. Just delicious. More than once I came back from working out and was starving and just dug in with a fork for breakfast and didn’t even care. Tastes that perfect. I like to heat the vinaigrette a bit so the garlic cooks and you’re not all omg-I-just-ate-a-huge-chunk-of-raw-garlic-in-this-bite. Sometimes I can deal with it and sometimes I can’t, and with this salad, I prefer not to. There are so many other things you can add to this based on your preferences too – you can even coarsely chop the chickpeas and use it as a vehicle for chips. For weeks I was eating it with some toast spread with coconut oil (as pictured) but now… the whipped feta just wins. It’s ridiculous to do it any other way. And!! The best part is that it takes minutes to throw together and LASTS. I like it best once it’s sat in the fridge for a bit so all the flavors can marry (I hate that expression) but it’s not anything close to terrible if you want to eat it right away. It may even be a bit warm from the dressing which is serious stuff. Good serious stuff. Seriously serious. 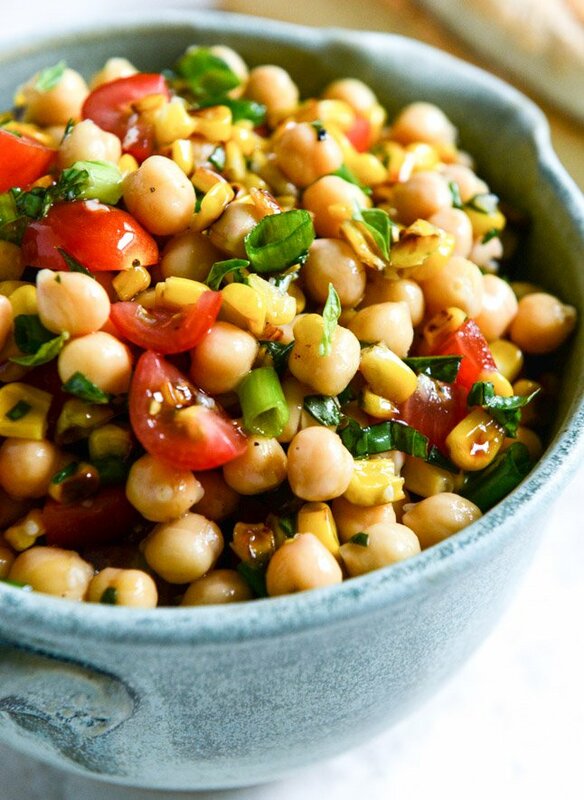 In a large bowl, combine the chickpeas, onions, corn, tomatoes, basil and chives. Toss well with the salt and pepper. In a small saucepan, add the oil, vinegar, honey, garlic, lime juice and zest. Heat over low heat and whisk until the mixture is warm and garlic cloves are sizzling a bit. Pour the liquid over the chickpeas and and toss well to coat. Cover with a piece of plastic wrap and refrigerate for at least 30 minutes before serving. It tastes better as it sits! Serve with toasted baguettes spread with coconut oil or whipped feta. now you have room for ice cream. what do you think, how long can the salad stay in the fridge and still be yummy? Wow made this and it is really delicious! Hi, I have made this salad weekly – for the beach, for BBQ, for pita chips (dinner, right? ), etc. and every single time whole family loves it. Thank you! This is an amazing salad, I have shared with family and friends.. I have also added Jalapeños finely chopped and persian cucumbers for a crunch. It does not last long in my fridge. Sounds good! I plan on making it.